How Much Play Time Does Your Rabbit Need? The number of hours of “run time”, as we call it, varies dramatically from expert to expert, if they are asked. Some rabbit lovers say that they need three or four hours a day out of their containment, others say one or two. I know from experience working in shelters and with other rabbits that in practice, this time usually isn’t even a full hour. Due to the lack of volunteers and the number of rabbits in the shelters, most shelter bunnies are lucky to get out of their cages once a day, much less for hours at a time. When I go in to volunteer at the shelter I work at, I make sure that every single rabbit gets out for a while. How long? Never for more than an hour, in order to get them all out that day. So what happens when a rabbit does not get enough time out to play? That is a really good question and while I cannot give you the medical information about it, I can give you anecdotal info about what I have seen happen to rabbits who are kept cooped up for too long. The first thing most people will notice is that when a rabbit is not getting enough “run time”, he will not want to go back to his enclosure when you deem that his playtime is over. He is trying to tell you that he is not done with his exercise and does not want to go back to his “jail cell”. When a rabbit has had plenty of time to run and hop, they will be much more willing to go back to their house because they will be all pooped out from their running around. They may not enjoy going back to their abode, but at least most will not fight with you over it. This said, some rabbit NEVER want to go back to their condos. This often occurs when earlier in their lives, they were locked in a cage and never got out. They fear getting put back into their abodes because they worry that they will be locked inside again and forgotten. This is quite traumatic for bunnies and they sometimes never get over it. All they remember is that they were put into a house and left there for a long time. Wouldn’t you never want to go back, if you thought it might be for weeks at a time? As you can see, getting out for regular play sessions is as important for a rabbit’s mental health, as it is to love and never abuse him. When a rabbit does not have the fear that his playtime may be the last for a very long time, he does not worry about getting put back inside his abode. I have found that rabbits who fear being kept in cages do much better inside an x-pen environment. For some reason, x-pens do not feel the same as a cage to a bunny who does not like them. Rabbits who were cage protective or fearful of being put into a cage, seem to get over it when they get to spend most of their time in an x-pen instead of being caged. If you have a rabbit who hates his cage, you should seriously consider switching to an x-pen living style, instead. Besides not wanting to go back to his cage, what are some other signals that your rabbit is not getting out enough? The one that I notice the most is cage protectiveness. When a rabbit’s whole world becomes a small cage, they become very protective of it. If you rabbit is attacking you when you reach into their cage, maybe they are not getting out of it enough. Not only female rabbits become cage protective, which is actually a persistent rabbit myth. Usually they are, but when male buns are kept locked up too long, they can also acquire that trait. I find that younger rabbits, just like younger dogs and cats, need more play time. During a bunny “puppy stage”, they will race around and do big hops a lot more than when they are older. Some of the smaller “dwarf” breeds never seem to grow out of this stage, but I find that virtually all baby and adolescent rabbits are more active than older buns. This means that if you have a young rabbit, that he is going to need more “run time” than say a five or six year old bunny. One of the biggest drawbacks for a rabbit not getting enough playtime is the same as for a human who does not get enough exercise. This is becoming overweight and developing cardiovascular disease. Rabbits were born to run and when they do not run enough, they will usually have an early death, just as their human counterparts do. This does not happen quickly and takes years to develop, but it happens just the same. Your rabbit is not going to die an early death from not getting out enough once or twice this week. It will take years of this type of neglect to affect the long term health of a bunny. The problem arises when a bunny is only getting out to play rarely, if at all. Honestly, once or twice a week is not enough. Instead, if you love your bunny, you should consider it part of your daily routine to make sure that your bunny has his run time. I know that we all have lives to live and that things come up which will cause your bunny to miss one of his appointed run times. I suggest that you should feel bad about it, though. Even more important, if you are in tune with your bunny, you will hear him tell you that he was not happy about it, either. Many people are not in touch with their rabbit’s feelings and will totally miss that they are expressing dissatisfaction about not getting to play. That is sad. One of the best parts about having pet rabbits, is how communicative and expressive they really are. If you are missing communicating with your bunny, you are missing the best part of having them as pets. A really important part of your rabbit’s playtime is supervision. You cannot turn the equivalent of a two year old loose in your house unsupervised to play alone. Part of what bunnies love about playing is interacting with their humans. They not only need this, but most bunnies crave it. Their playtime should not be without part of it involving interaction with you. This makes a huge difference in the bunny-human bond and will enhance both of your lives dramatically. Even more important, you MUST NOT just set your bunny free to run in your yard, no matter how protected you think it is. There has never been a fence that can keep a rabbit inside. They are masters at burrowing. Also, there is not a fence that can keep out the many predators that will harm your bunny. Coyotes, hawks and raccoons cannot be kept out by a fence. Domestic rabbits have virtually no defenses against these predators. If you are not right there, it will be too late for you to save them from an attack or worse. You would not believe how many times a month that people tell me that their rabbit plays unsupervised in their yard. Your rabbit may escape harm for years running in your back yard, but it is only a matter of time before he either gets away or has a problem. These stories that I hear, almost always end with “one day he was just gone”. Well, DUH?!? Again, if you really love your pet, you will not allow even the chance of this occurring. 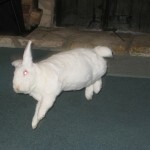 All rabbit run time should be only in a rabbit safe environment. This means a bunny-proofed part of the house under direct supervision. At least part of the time should be spent with your bunny up close and personally so that you can interact with him. IF your bunny is allowed playtime outside the safety of your home, then it needs to be with you RIGHT THERE watching and insuring his safety. Not with you inside the house in the kitchen or watching TV. You would not let a two year old play outside, while you took a nap. There is not difference for a pet bunny. As to how long is long enough, I say that one or two hours daily should be the minimum with three or four hours the best. Younger rabbits will need the longer time period, while seniors might be happy with just an hour or two. Rabbits are the most active in the early morning and early evening. This is their preferred playtime, but a caged rabbit will take playtime any time he can get it. If your rabbit just lays around during his playtime, it could be because you are letting him out during his nap time. Most rabbits like to sleep most of the day. Mine are napping most days from about 10am to 4pm. They are racing around and playing very early in the morning (6-9am) and in the evening (4-8pm). I know that we all have our human schedules to keep and your rabbit will adjust eventually to yours. They like their lives to be regular and timely, meaning that if you let them out or feed them at a certain time each day, that they will come to expect it then. Bet you didn’t know that rabbits can tell time? My rabbits are always waiting for me at their regular feeding or run times. They seem to always know the time and prefer these things on a schedule, but it is better that they get out at all than to not have their playtime. 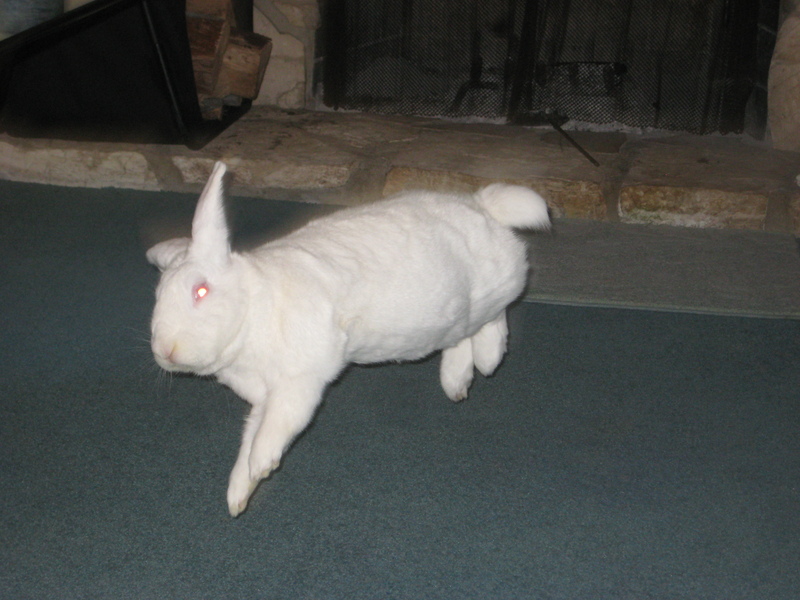 So do not hesitate to let your bunny run at whatever time you can work it into your schedule. I have awaken my buns at midnight to let them out and trust me, they were glad about it. It may have taken them a few minutes to get the sleep out of their eyes, but within minutes they were gleefully hopping around, just glad to be out to play.